pen drive file recovery Windows 10/7, free software helps you recover lost, deleted files from formatted Pen drive after format or delete or lost data due to not formatted , not recognized , not working ,not showing up, power failure,logical damaged.Free download and trial. Use "Undelete" mode to recover deleted files from pen drive after Virus attack,Recycle bin clear,disk cleanup,Press shift del by mistake,permanently empty recycle bin,shift delete ,accidentally deleted by a mistake..
Use "Recover partition" mode to recover files if pen flash drive partitions changed or damaged or deleted. Use "Full Scan" mode to retrieve lost files if pen drive show as "raw"or recover deleted files which can not be found with "undelete" and "unformat" and "recover partition",restore files from raw partition,recover files of partitons which are not NTFS,nor exfat,nor fat32. Pen drives offer potential advantages over any other portable storage devices, particularly the floppy disk, the optical disk, and the magnetic tape. It is used in data transportation between computers, important files backup, documents storation, and many other aspects of data sharing. But just like data stored on hard drives, pen drive data loss may be very emotional time for everyone, if it happened, this article will help you recover your pen drive data easily and rapidaly. Pen drive is one of the best storage media to transfer special data from one device to other in fastest way, for example you can store large amount of data ranging from pictures, video clips, songs, official documents, presentations and many more. Pen drive has a more compact shape, operates faster, holds much more data, has a more durable design, and operates more reliably due to their lack of moving parts. Although pen has a lot of advantages than other storage device, pen drive is easy and efficient to use in comparison to floppies and cd's but it can easily subject to data loss due to number of reasons including deletion, formatted or corrupted media, virus attack, human errors etc. If you get stuck in the same situation of data loss then no need to rush towards recovery centre, you can recover it by using manual data recovery service or data recovery software. Data recovery software provides complete solution to recover lost or deleted files from pen drive media in very less time. 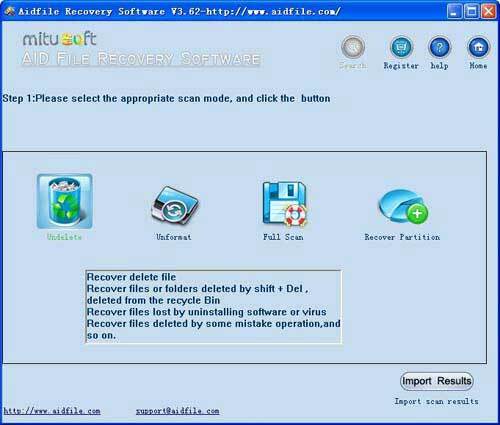 Here I recommend Aidfile Data Recovery which will start a professional data recovery process immediately. It is an advanced Pen Drive Data Recovery Software that allows you to rescue, salvage and recover lost or deleted files and folders from crashed, inaccessible and corrupted pen drive and other similar data loss. This powerful data recovery software will retrieve the data from pen drives safely and easily. With its abundant functions, it can also recover deleted, lost, damaged and formatted data from hard drive or partition. Why not have a try? Support WD, Samsung, Sandisk, Toshiba, Seagate, HP, Lenovo,Maxtor,ADATA,Kingston,Silicon Power,Corsair,Lexar,Transcend,Patriot,PNY,360LaptopParts,Aneew,Sasatao,AreTop,Gorgeous-USB Flash Drives 8GB,Slavatech,AYANGYANG,Keyscaper,smile angle,BestRunner,KOOTION,SODIAL(R),Lalakie,Techkey,CHUYI,LHN,Tfboys,Ciway,Liili,Tomax,COCOSO,Litop,U-DriveShop,D-CLICK,Luxlady,Usbkingdom,LXG,Doinshop,Eaget,Meco,Verbatim,WooTeck,Memoria Original,ebamaz,MSD,XBQQCAD,XXL,Olatec,FEBNISCTE,FMNKU,YKQJING,Zoegift,Qingsun,etc.